We live in a functional world and we choose tools that meet our needs. 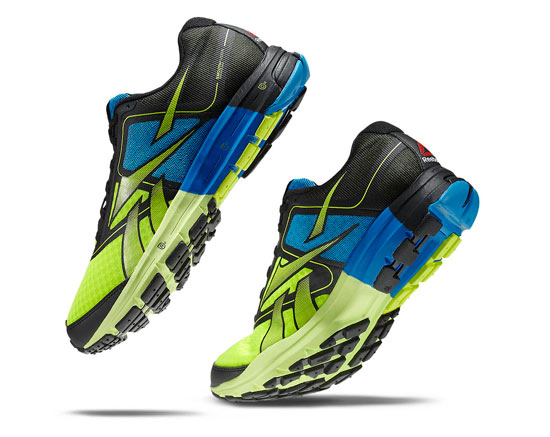 So should the shoes affect our running style or should it match our running needs? 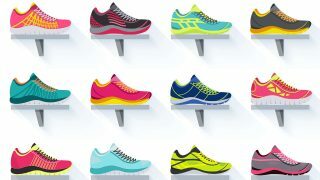 The Reebok One Series is here to change the way we think about running shoes. For many years, shoes have been built in bottom-up layers – outsoles, midsoles, and upper unit. 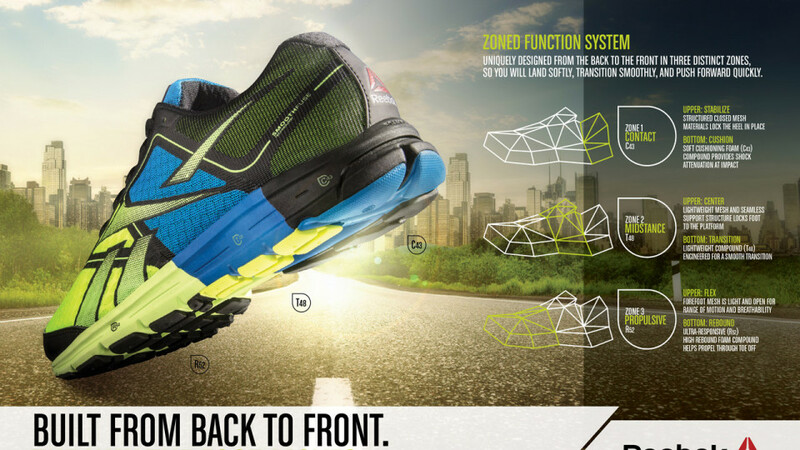 Built from back to front, the Reebok One Series features “Zoned” technology that caters to the way our feet moves, meeting the demands of runners through each phase of the Gait Cycle. Our feet moves from the back to front while running so the Reebok One Series is engineered to work harmoniously as one system to give you a soft landing, smooth transition and powerful push off. 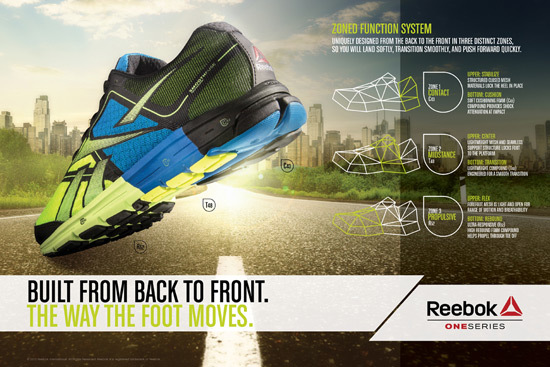 The Reebok One Series features 3 distinct zones, complementing the runner’s needs at the respective phase of the gait. The Contact Zone features a soft foam (C43) compound that provides shock attenuation with every stride and the structured closed-mesh material locks the heel in place. The Midstance Zone features a lightweight (T48) compound to provide a smooth midfoot transition while the lightweight mesh and seamless support structure locks the foot in place. The Propulsive Zone features an ultra-responsive high rebound foam (R52) compound to help propel the runner forward during toe-off. The forefoot mesh is light and open to allow free motion and breathability. The FOAMFUSION bonds the midsole zones together while the SMOOTHFUSE seals all the upper zones. “We seamlessly fuse all the components of the One Series together so it feels like one continuous smooth system. That’s where the “One” name comes from. You can feel the difference right out of the box,” said Reebok’s Head of Global Running, Bill McInnis. 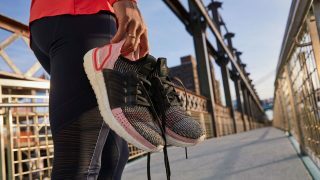 The Reebok One Series has specialised shoes for different types of running requirements but debuts, this Fall, with the road models – Reebok One Cushion and Reebok One Guide, available in both men’s and women’s. The Reebok One Cushion is designed to maximize comfort and performance for runners with a neutral gait. The stable and flat lateral arch area gives maximum ground contact, the outsole release zone provides pronation control, and the outsole progression groove gives the shoes longitudinal flexibility. 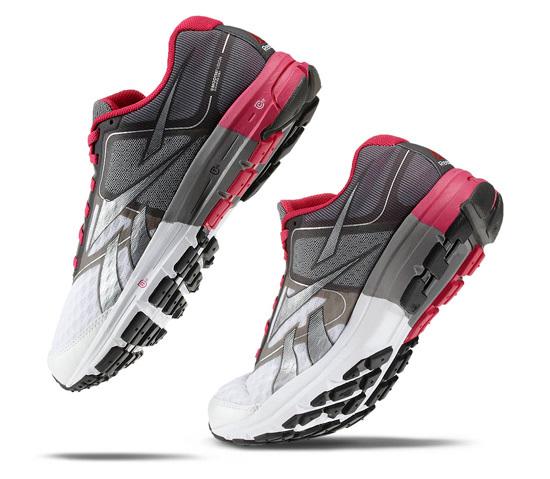 The Reebok One Guide is created for mild to moderate pronators. The three-foam midsole provides comfort and a flatter medial arch provides stability. Both series employ the technical upper construction for fluid, seamless motion. Elite marathoners including Alyssa McKaig and Esther Erb have worn the One Series. Beyond running shoes, the One Series apparel collection accompanies its footwear silhouettes. The collection is lightweight and incorporates strategically placed mesh to ensure comfort and breathability, making it ideal for performance running. Fashionable Reebok Graphic detailing provides a unique and stylish look, while 360 all-round reflective armour keeps runners safe even in darker conditions. The Reebok One Series comes in both Men’s and Ladies’ styles and will be available at all Stadium and Royal Sporting House stores islandwide except Outlet stores.